Robert was the son of Henry (Harry) Ewart and elder brother of John Peter Ewart (my great grandfather). I have recently found references to a Mrs Ewart so I now believe he did marry at some point. The only reference I have to a child is that of a step daughter. Robert spent his life walking, prospecting and exploring the hostile West Coast of Tasmania and on these pages I have attempted to gather some information about a man who helped open up these areas. 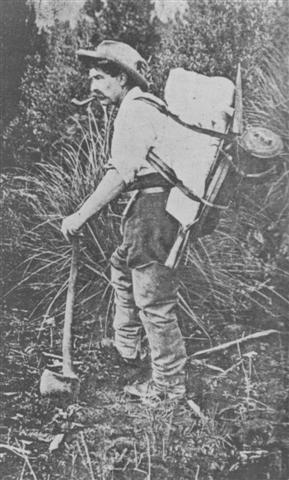 ..."Mt Ossa may have been first climbed by either the trackcutter Robert Ewart or the trapper and prospector Paddy Hartnett from his base at Du Cane Hut"
In order to get a clearer picture of the man I have compiled a chronology available from here as a PDF. This will change as I seek and verify more information. The following newspaper reports and book excerpts help to give a description of Robert and the work he carried out. This is a collection of newspaper reports found through the National Library of Australia's online database. They cover the years 1901-1929 which was when Robert died. Excerpt from "Explorers of Western Tasmania"
"THE MERCURY Thursday 15TH AUGUST 1929 p8"
The funeral of Mr. Robert Ewart which took place on Tuesday afternoon at Zeehan, was largely attended by all classes of the community. Among those present were the Warden (Councillor Kean), several councillors, and the council clerk, also members of the Masonic Order and the A.N.A. The burial service was conducted by the Rev. R. T. Alexander, and P.M. Bro. W Thomas, read the Masonic service at the graveside. There were many wreaths from Zeehan, Queenstown, and Melbourne. A telegram was received from Mr. Selby Wilson asking that a wreath be placed on the grave in his name.